Are you looking for someone to harmoniously enhance your fabric pieced work of art? Add the finishing touch of a hand-guided longarm quilting machine to your masterpiece. Or have a custom quilt created for your special occasion. I am Aimee Mahan and I have an interior design background and love applying the principles of balance, scale and rhythm to quilting. It is a joy to see how color and pattern become alive, at times with surprising results! I enjoy both traditional and innovative quilting and hope I can enhance your artistry with a custom drawing from the needle of my hand guided longarm quilting machine. 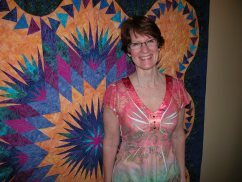 Since beginning her business in 2002, Aimee has received over 100 1st Place, Best Quilting and People's Choice awards in numerous cities throughout the United States. Her Fiber Art has been exhibited in many venues throughout the Unites States and Australia. Aimee's creative work has also been featured in several publications including: "Better Homes and Gardens", "Quilt", and "Fons and Porter's Love of Quilting." Book publications include: "Quilted Home Decor" by Terri Kralik and "Four Seasons at Minglewood" and "Baskets, Birds and Boughs" by Debbie Roberts. Creating custom designs for machine quilting is second nature to Aimee and has taken her to producing and distributing through www.digitechpatterns.com. Check out this gallery of fine quilted products and even order right online. Hand-made wall hangings, pillows and quilts make great gifts for birthdays, house warmings, parties and Christmas gifts.